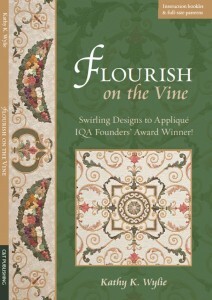 The vertical borders on the quilt Flourish on the Vine feature a distinctive appliquéd motif between the swags. The motif was designed to fill the extra space caused by the rectangular shape of the center panel. Its proportions made it a good fit for the borders, but I wondered how else the motif could be used. Then I came across the Grids and Grommets Bag by Indygo Junction. With a bit of measuring and planning, I discovered the vertical border motif would fit here too! 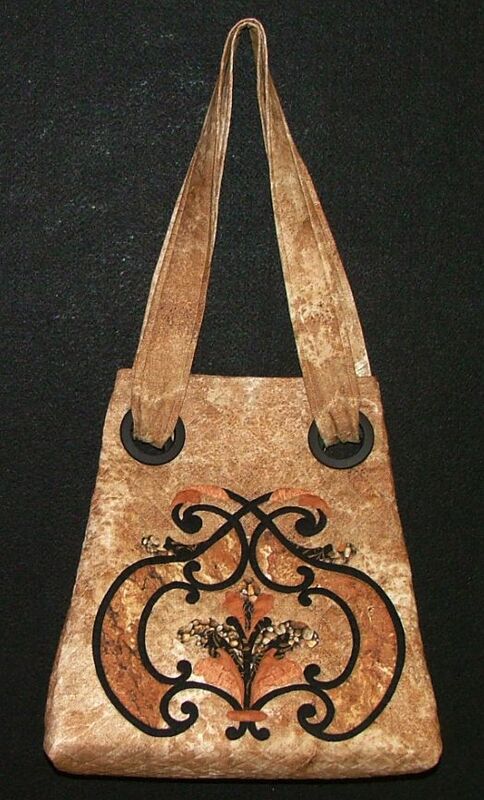 The motif was hand appliquéd to a beautiful Stonehenge fabric first, then quilted and constructed into this handbag with flourish. Align the horizontal center 10.5″ from the left edge and position the motif 4.75″ from the top and bottom edges. If desired, baste a contrasting fabric for the underlay sections. Appliqué patches V.8 through V.29 in place. Complete the handbag according to the Grids & Grommets pattern.